The last six months or so have been crazier than usual, of which this poor neglected blog is certainly a testament. To briefly recap: in June, I was named Interim Executive Director at the museum where I’ve worked as educator for the past nine years. I spent four weeks this fall at a professional development seminar in Indiana. And the weeks surrounding that departure were crammed with work things, a friends wedding (I was maid of honor), my parents’ 65th birthday party, and of course, the holidays. Now that it’s January, I feel like I’m starting to get a sense of what the new normal is. At the very least, I’ve found time to read and watch tv again! Several of my friends had equally crazy (though for different reasons) falls. They also happen to share my love for Anne Shirley. In talking with one friend back in October about that lovely blank spot between Christmas and New Year’s, we decided that an Anne party would be the perfect way to celebrate making it to the end of 2013. Tea, raspberry cordial (with optional hooch), tea-time food and the movie. Because I am somewhat nuts, I decided that I would also haul out my entire Anne collection for party decorations. Now, I knew I had a lot. After all, I’ve been collecting since I was nine or ten years old. If you’d been keeping an eye out for things for 25 years, you would have a lot too. But seeing it scattered throughout the house was kinda amazing. I believe guests were both amazed and frightened. In my defense, the only things that are ever out all the time are a few pictures in the guest bedroom. Though I will confess that I left out a few of the Anne dolls and added my Little Women porcelain figures and my Laura Ingalls Wilder (the author, not the little girl!) doll for this month. yes, those are four different versions of Anne of the Island. Turns out I have the most copies of that one. One friend brought scones and another egg salad sandwiches. I made cucumber sandwiches, pimento cheese (yes, I know that’s not in Anne, but I live in the South where if you have tiny tea sandwiches, pimento is required! ), raspberry cordial, and plum puffs. Plum puffs! Complete with stills from two of the movies. Here’s the thing about Anne: we all adore Anne, but we can also make fun of her. After all, what child, even in the 19th century, ever talked like that? We started being snarky from the very beginning, which made watching so much more fun. We laughed in places where as a kid, I would never have laughed. I would have just nodded my head because I understood perfectly. We talked back to the movie often. The champagne might have had something to do with that. About halfway through the movie, we started imagining backstories for some of the secondary characters. If Aunt Josephine is so rich, why isn’t Mr. Barry? Was there some sort of family argument? And how did she become so wealthy? Was she a madam? It went downhill from there. By the end of it, Mr. Barry was a serial killer, Mrs. Stacey had some sort of secret double life, and I can’t remember what all else. It was hysterical. If we were really clever and not so busy, we could write one heck of an alternate history of Avonlea. It’s not often that I get to celebrate my love of kidlit history with others in person and not just online. That moment of discovery can be so delightful. After all, there has to be a moment of discovery because it’s not like I talk about such things all the time. (Contrary to the belief of one friend who teases me often about this interest and refused to come to the party because she “might be converted.”) I discovered one kindred spirit when she noticed a very discreet watercolor of Green Gables at a housewarming. Another was discovered during a workplace conversation about Little Women (a theme for one of our events. Gee, I wonder whose idea that was. . .). Bringing everyone together was such fun. The bookshelf that holds all of my older versions. They no longer fit on one shelf! Around here, school is about to start. This is quite evident with the flashing school zone lights, and the conversations among the younger set. I spent Sunday night hanging out with two of my favorite girls, Grace and Sophie. However, the usual “back to school” conversation took an unexpected turn. Grace, now 11, started talking about boys. It was a very long conversation. Questions were posed such as “Would you rather be kissed by the dumbest boy you know? Or a dumb boy you don’t know?” “If a boy kissed you, would you faint from embarrassment?” I also learned that Sophie had a pre-school boyfriend, who she kissed every day. And Grace has her first official crush. Luckily, she’s in that stage where she can still talk to him and not blush, but she’s also desperately hoping he doesn’t figure it out. In the middle of all of this, I hopped up from the table and turned on my nook. Since finishing up the Betsy-Tacy books, we’ve been reading Anne. I have never before been so nervous introducing a book to kids before. Anne is so near and dear to my heart. What if they didn’t like her? Before we read the first chapter, I told them that if they didn’t like it, I understood–that there were lots of other books I wanted to share. As I started reading, I got more nervous. It is a much harder read-aloud than Betsy–the rhythm and pacing are so different. I also worried about the whole “are you going to send me back” part because these girls are also adopted. I shouldn’t have worried. Grace, Sophie and I are indeed kindred spirits and they really like Anne. Anyway, back to my story. I knew we were getting close to the wonderful scene in which Anne thwacked Gilbert with a slate. But would we get to it tonight, after talking endlessly about the problems of liking boys? Miracle of miracles, it was the next chapter! What are the odds? Life lessons through literature, handed to me on a silver platter! So, we read about Gilbert teasing Anne. And Anne setting Diana drunk. And I was struck anew at how funny Montgomery is–and how true those scenes still are. They totally got why Anne was so mad at Gilbert–and we talked about the deep desire to sometimes whack a boy with a book (not a slate. I had to explain what a slate was.) I watched as Sophie and Grace’s face lit up at the thought of hosting a friend without the parents around. I’ve read this book so many times now that the lovely details often just wash over me. As I stumble over some of Montgomery’s “poetical” words, laugh at the jokes, and watch the girls’ reaction as they hear this classic for the first time, it feels like a fresh, new book. Judging a book by its cover. . . Again. I first ranted about covers of Anne back in 2009. And then just this week, many kindred spirits joined my rant. A new cover of Anne went viral–Anne is remarkably modern, and more shockingly, blond! I mean, if you’re going to switch Anne’s hair color, shouldn’t you at least do something she would want? Like raven black? Anyway, it was all over facebook–and how could fans resist sharing their shock and horror with a cover like this? Seriously, I don’t even have words to explain how inherently wrong this is. I just went to amazon, and this is now “out of stock” and no cover is pictured. Methinks they heard the rants from around the world and actually did something about it. Be sure to check out the comments. I’ve never seen so many one star reviews on Amazon. Alas, this publisher is just part of a long line of people that have done horrible things to the covers of the Anne novels. And here’s a link to my original post, complete with lots more horrifying covers of one of my favorite books. Isn’t that more like it? 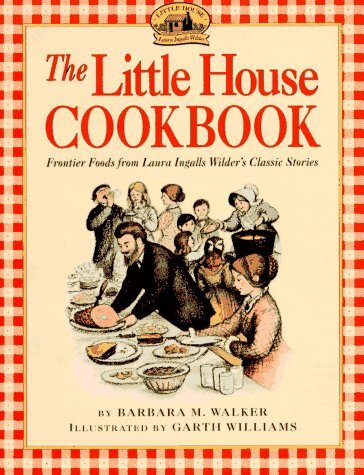 It’s not often that I read a cookbook straight through, but after dipping in to The Little House Cookbook, I knew this was one that I had to read. It has been out for a very, very long time (1979), and I have a very dim recollection of checking it out at the library when I was a kid. But I had never gotten around to purchasing it for my library. After reading it cover to cover, I’m thrilled to add it to my kidlit history shelves! From a historical perspective, Walker does a wonderful job of talking about the challenges of cooking in the 19th century. She talks about the shift from hearth to stove. How to preserve foods. What could be purchased from a store–and how exciting it was when new products were born. It’s stuff we try to explain to visitors at the museum on a regular basis, and her introduction to these complex stories is superb. And from a kidlit perspective–this book is pure magic! These books spend a lot of time on food. Quick–how many Little House foods can you name? I’ll wait. See? A lot, right? I think it is physically impossible to read Farmer Boy and not raid the kitchen. There are so many wonderful things to think about: fried apples n’ onions, vanity cakes, green pumpkin pie, doughnuts, even something as simple as popcorn just sounds better after reading about it. And this cookbook has all these recipes and more. Of course, Laura didn’t include recipes for everything, and Walker’s research skills really show here as well. She hunted through period cookbooks and tested and tested again to make these recipes possible for modern cooks. Granted, there are several recipes I have no interest in trying (roasting a whole pig? umm, no), but the fact that even those recipes were included makes this book extra special. My delight in reading this book reminded me of a treasured book from my childhood. 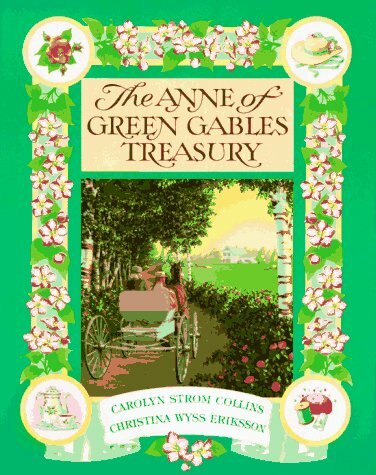 Back in 1991, Carloyn Strom Collins and Christina Wyss Eriksson published The Anne of Green Gables Treasury. Picture this: nerdy, 12 year old Melissa on the phone with a friend who also loves Anne. We’re thumbing through our respective copies together, squealing and giddy. Finally, we have the answers to so many questions! A map of Avonlea! The floor plan to Green Gables! A tea time menu, complete with recipes for Monkey Face Cookies (which are wonderful!) and Plum Puffs (also quite good)! Explanations of the clothes! Oh, it was really, really exciting. Collins and Eriksson have gone on to publish more Treasuries, including books on The Secret Garden, Little Women, and of course, Little House. They are all quite good, but in my mind, none of them have had the magic that the Anne treasury did. Suddenly, almost all of my questions were answered. It was like these authors had uncovered these secrets that L. M. Montgomery had left buried in the books. Books like these certainly aren’t for everyone. A lot of readers may not want to go beyond the page. But for those that do, I thank people like Barbara Walker, Carolyn Strom Collins and Christina Wyss Eriksson. They’ve brought me a lot of joy as a reader–and certainly helped grow my love of history.